I’ve been painting gloss work at home; door frames galore and literally mile upon mile of skirting – or so it seems. I’ve also grown increasingly annoyed, irritated and badmouthed at a new laptop. A new laptop that won’t connect wirelessly to the net. I’ve tried so many ‘IT solutions‘ but it still won’t OBEY me. Next up is solution 36 – hurling it against a brick wall. So what with painting, a sulky laptop and a couple of novels that were physically impossible to put down, there has, I’m afraid, been a bit of a gap since my last post. The days are whizzing by and we’re hurtling into autumn with no brakes. STOP! Please. Despite writing a few weeks ago how I was relishing the prospect of autumn, I have now changed my mind (a gardener’s prerogative) and am savouring these long, hot and hazy summery days. I have built up a logjam of photos over the past few weeks – my computer is groaning under the weight of them all. … certainly mysterious Priory Fern and Turks Cap Lily Boat. So here’s a quick splurge to free up some disk space. 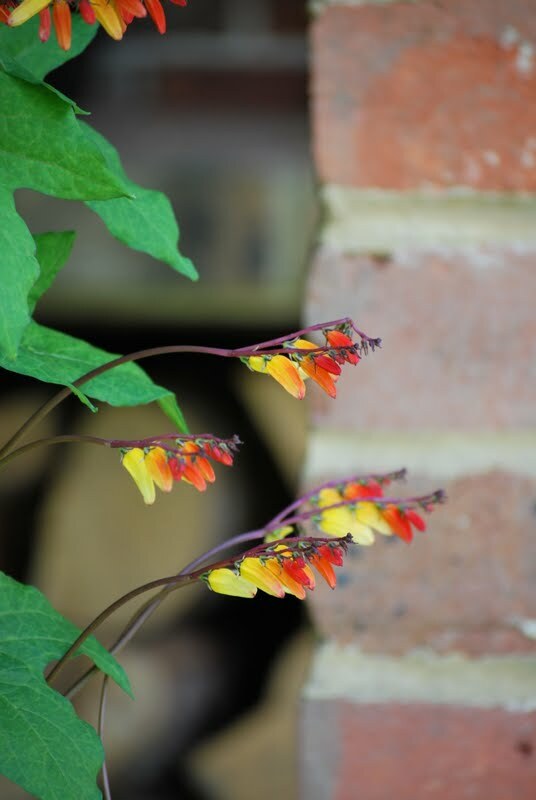 I hadn’t grown Spanish Flag (Mina lobata) before. 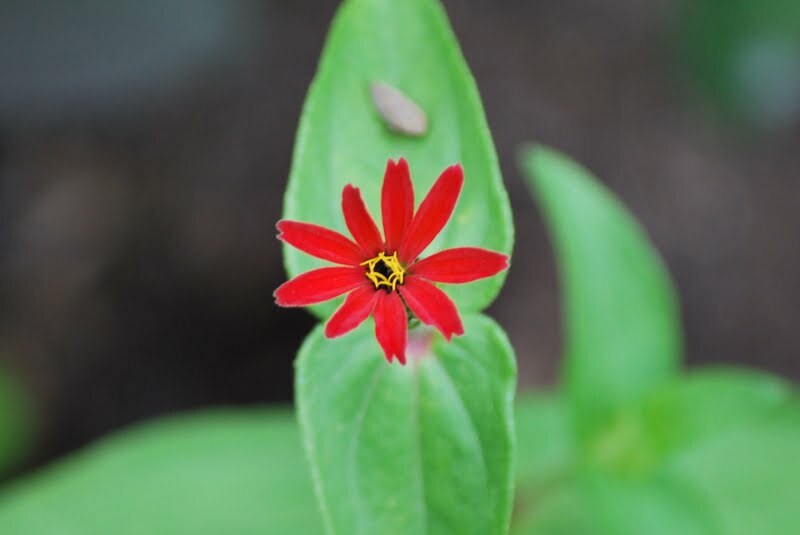 Technically it’s a perennial but not in Sussex, where I grow it from seed and treat as an annual. I’ve been impressed by how easy it grows and the sheer amount of flower, and at how pretty it is. I’ll certainly grow it again next year. 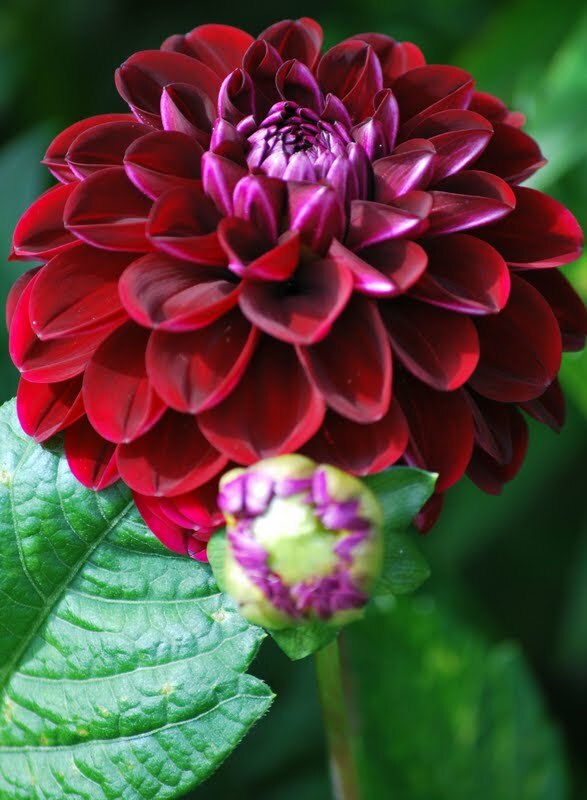 Normally, my dahlia tubers sail through the winter wrapped in newspaper and stored in a cool, dry place. But this year I lost about a third to fungus. I suspect I hadn’t dried them out as well as I ought to have done. The ones that did survive were potted up and nurtured to a height of six inches or more before planting out into the new ‘Tropical’ bed. Otherwise, I find planting the tubers directly out into beds results in an almighty battle with slugs and snails. It’s the same if I leave them in the ground overwinter (heavily mulched against frost, of course). Planted out when they are of a size and a little more robust seems to afford them some protection. That and organic slug pellets. 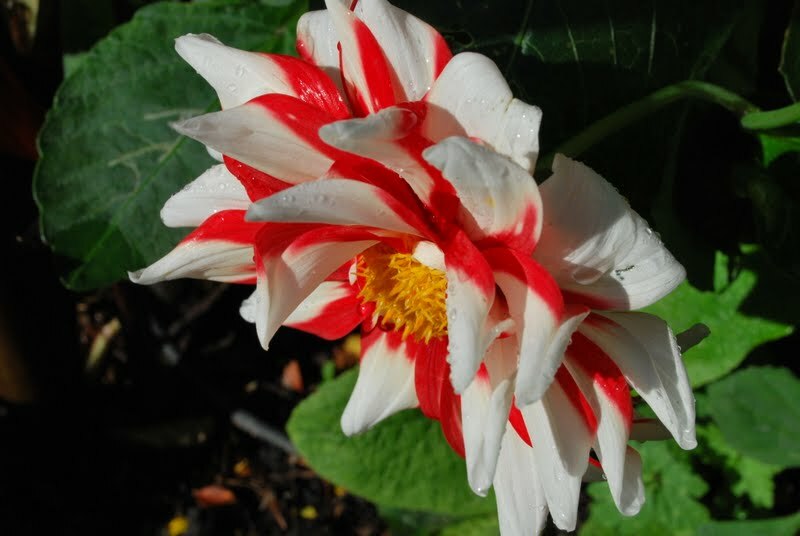 I did lose some varieties of dahlia altogether though – which is sad but an excellent shopping opportunity next spring! 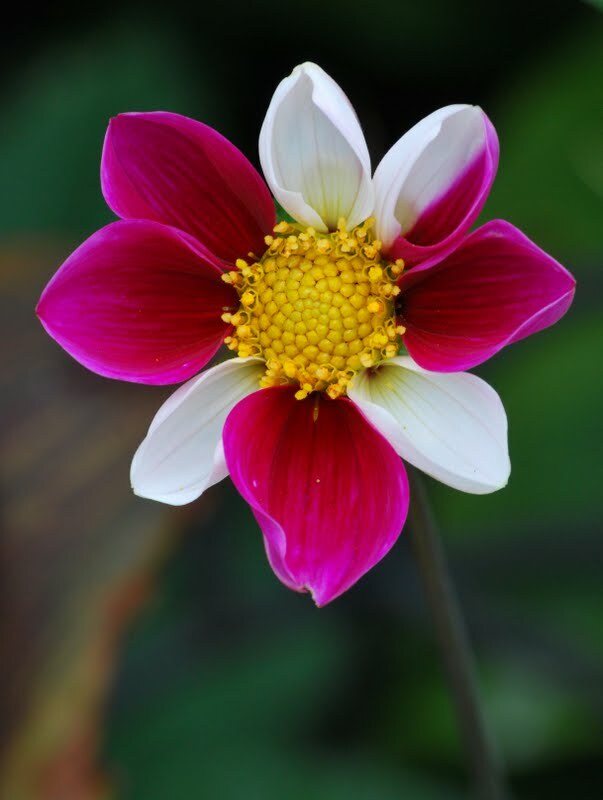 This is a tall elegant dahlia with no two flowers the same. 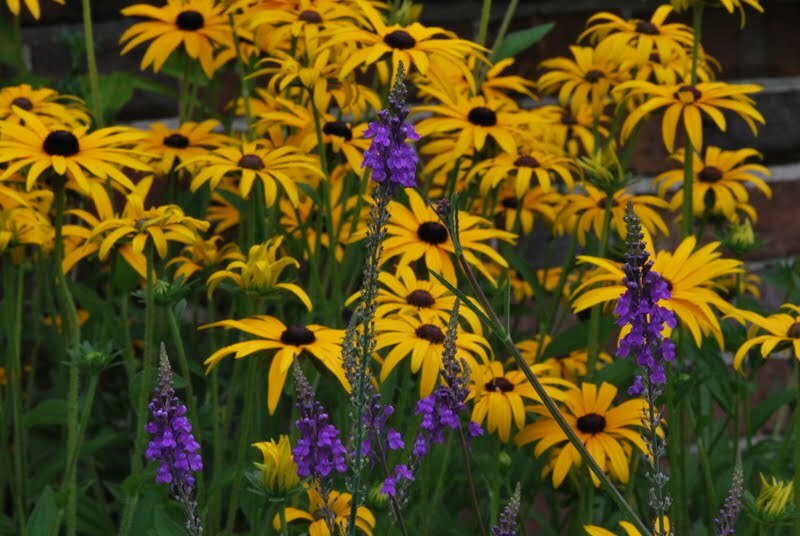 Rudbeckia ‘Goldsturm’ is just so reliable and so darn cheery. Couldn’t be without it; here growing with linaria. 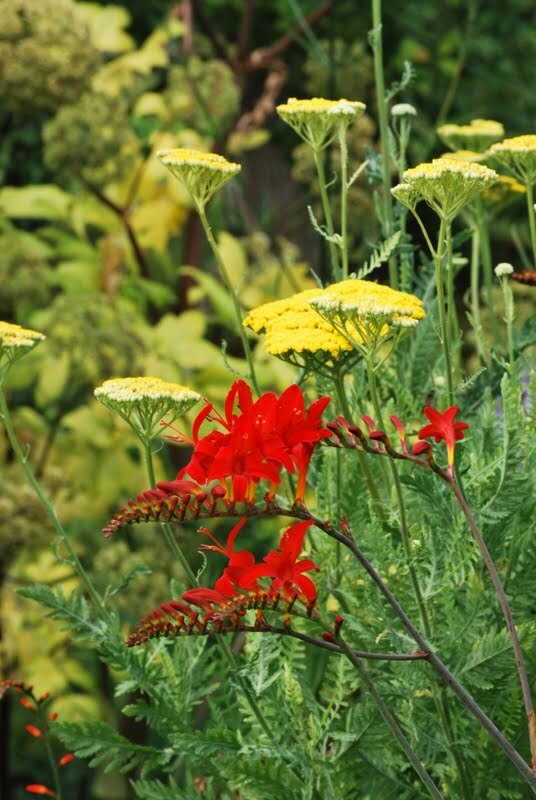 A combination that I’ve really enjoyed (sunglasses required) is Achillea ‘Cloth of Gold’ with the vibrancy of Crocosmia ‘Lucifer’. 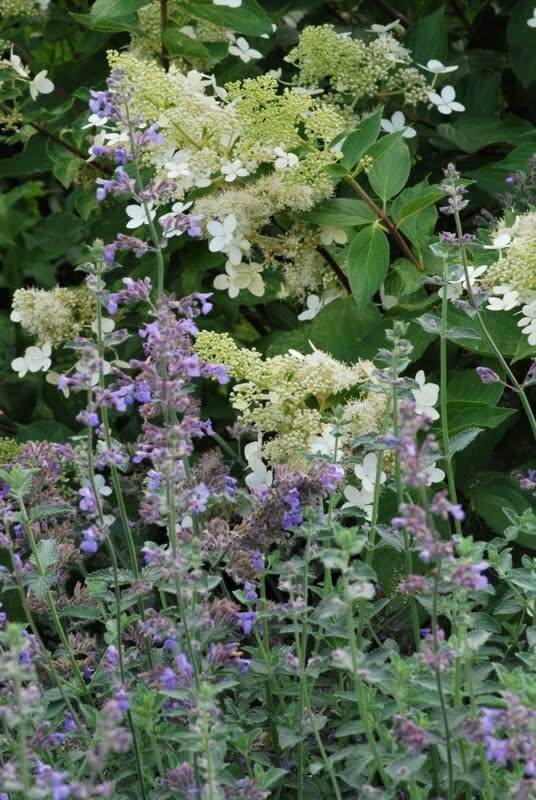 Far, far more muted is Hydrangea Kyushu (the only hydrangea in the garden – apart from the climbing, Hydrangea petiolaris) and Nepeta ‘Six Hills Giant’. 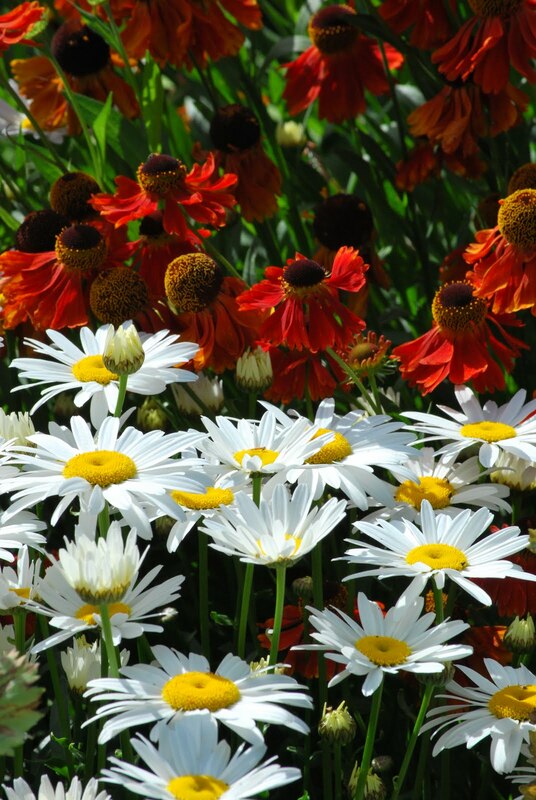 Here, shasta daisies (Leucanthemum x superbum – a glorious name, which is reason enough to grow it) against a backdrop of Helenium ‘Moerheim Beauty’. The amount of self-sown flowers has been wonderful this year. I think that is down to an absence of late frosts in May. 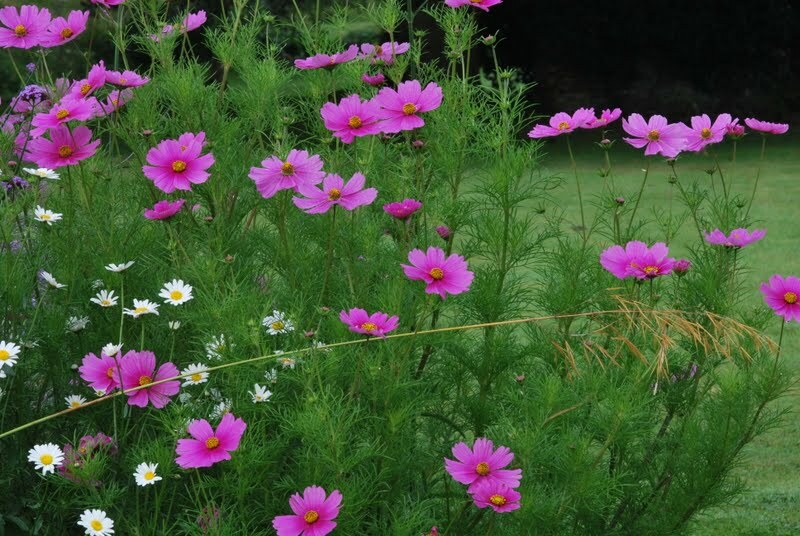 This Cosmos sprang up on its own accord in one of the kidney beds – with errant Stipa gigantea seedhead. I’m not a huge fan of fuchsias but this hardy Fuchsia molinae just drips flowers at this time of year. Here growing up against Zebra Grass (Miscanthus zebrinus) and above Ajuga reptans ‘Braunherz’. 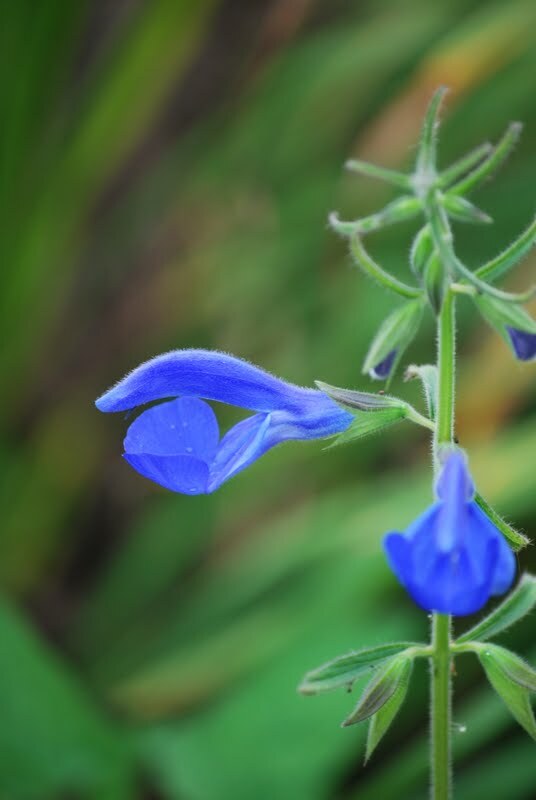 The latter is brilliant ground cover with loads of blue flower spikes in spring. All three plants went in during late 2008 and are now well established. Like the dahlias, I find it a battle to get Salvia patens up and out of the ground without a titanic life and death battle with slugdom. This is one of my favourite perennials though so worth the trouble. That blue – wow. 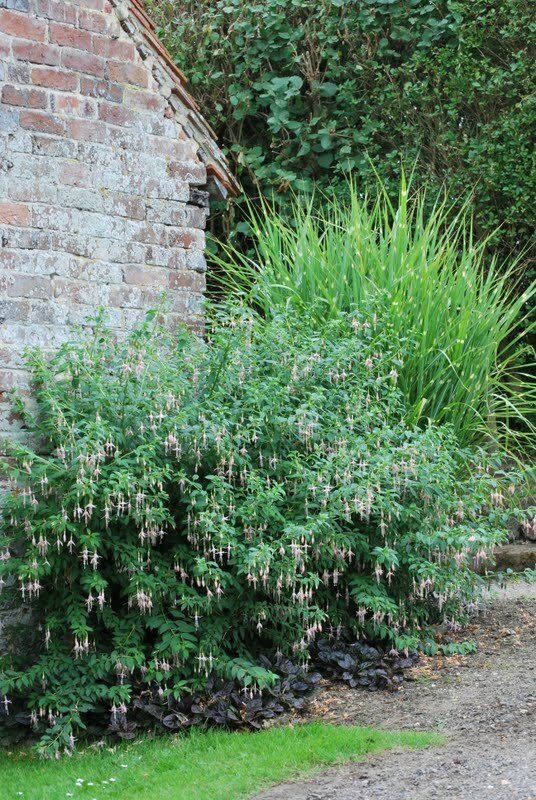 I should be able to show you a photo of my favourite salvia, S. ulignosa, growing in this spot in the kidney beds. Sadly though it was one of the plants I lost during our last, severe winter. You’ll have to use your imagination. Thanks. 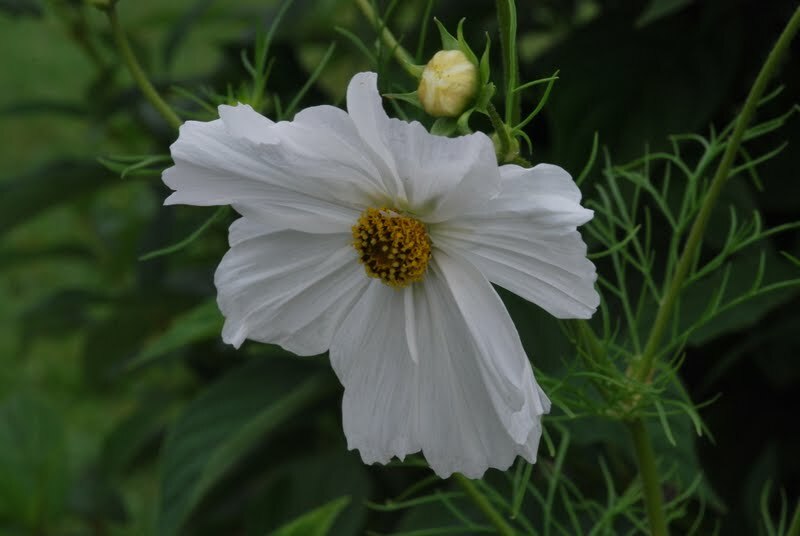 A real shame as it’s a tall stately plant that flowers for yonks, and the flowers are of such a pretty pale blue. I was still willing it to emerge long, long after it was obvious it was dead. And finally (I’ve still got an awful lot of gloss work to do and a laptop to beat into submission) the badly named toad lily (Tricyrtis formosana). I was given a pot of this gorgeous, if unusual, beauty and I’ve split it again and again to increase my stock. It’s only just come into flower in the past few days, is happy in shade and just invites close study. Thanks Janet, toad lilies are lovely – I keep on splitting them so as to increase their number. Lovely plant combinations and beautifully photographed. I've got a soft spot for toad lilies. Ours are not in flower yet but I'm looking forward to seeing them. I feel for your Goldsturm loss, Janet, I really do. I had no sunflowers this year as they became a slug's tasty seedling titbit. Could've planted more but never got round to it. Sad. Still, thankfully I no longer sob into my pillow over my loss. At least, not often. 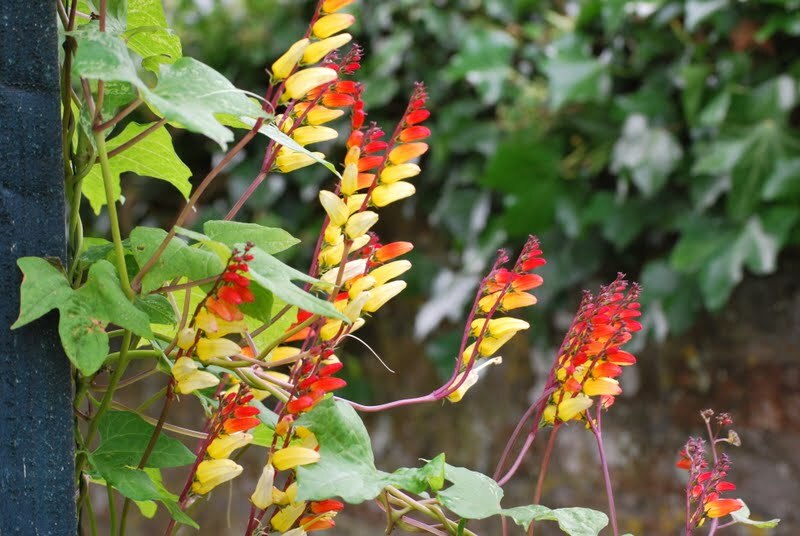 So many lovely plants – and lovely combinations. I share your feelings about fuchsias, but occasionally one steals my heart. I just never know quite how to use them – yours looks good against the wall like that with the grass behind. Am now even more sorry that my 'Goldsturm' seedlings all failed. Well Jason, like I said the origins of the boat are shrouded in mystery and myth. No one seems certain where it came from, what it's history is and why is it number 12? 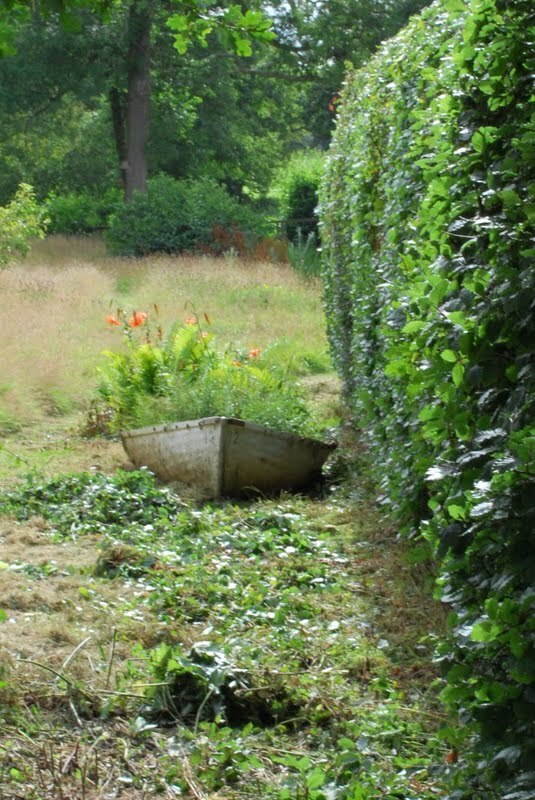 It was just rotting before I hauled it round the back of the beech hedge and filed it with a little topsoil and a lot of leaf mould, planted it up with ferns and added a few tc lilies. And it seems happy enough. There's another on the west pond that is moldering slowly away – it shall have a similar fate. Dumped on a roundabout somewhere and filled with pansies, I imagine. Hi Dave, I am curious to know why there is a boat stranded in a field? Who put it there? Was there once a river near by (is there a river near by?) perhaps it belonged to some monks? So many possible questions spring to mind! As for the plants, loving all the colour and splendour, I hope that you have some time to enjoy all and aren't just working flat out? I find that sometimes one forgets to look up and appreciate the garden. Hi Shawn, thanks for stopping by. Oooh, snow – you've just given me a shiver of excitement. But, yeah I'm holding onto summer with both hands too! No violence in the end, Stacy, just the press of a button. Were that all life's problems were so easily resolved. Mark my words. 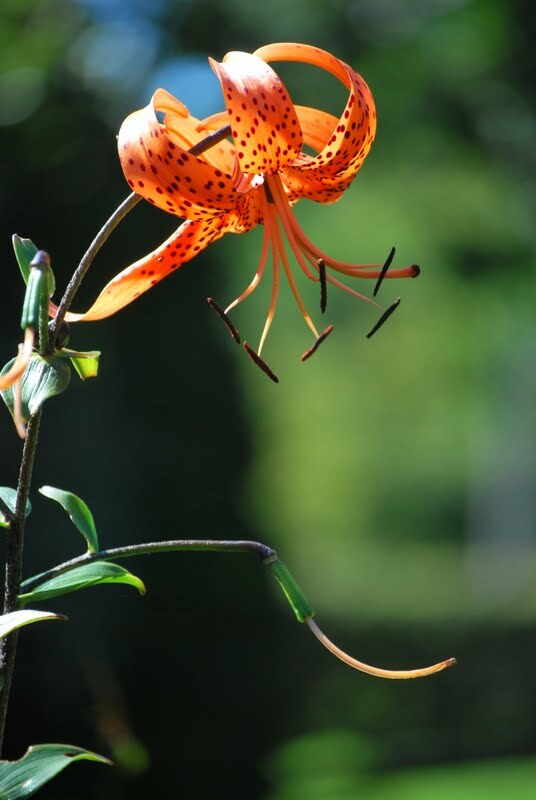 Next year you'll be tripping over fern and turk's cap lily boats in every garden and park throughout the land. And sadly, no. No sign of the mandarins – I'm hoping they went off somewhere else to raise a brood. I'm hoping. Real life? Goodness, no. Try to avoid it as much as humanly possible! Smarty is a lovely plant and I haven't had too much of a problem with earwigs. I had planned ye olde worldey methodey of earwig controley (flower pots stuffed with straw and inverted on canes and emptied every morning) but it hasn't seemed necessary. Hi Petra, no. Theanxiousgardener.blogspot.com Inc (UK Div)'s budget wouldn't stretch to a Mac (in fact it barely stretches to a notepad and pen). 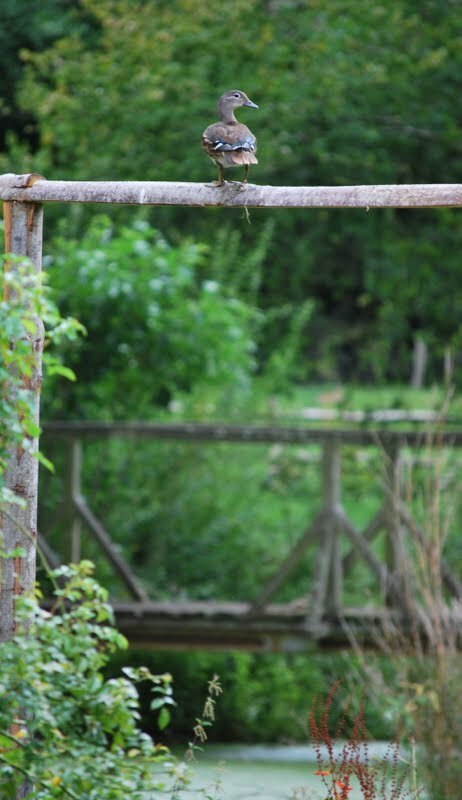 The espalier sounds lovely if big – good luck. 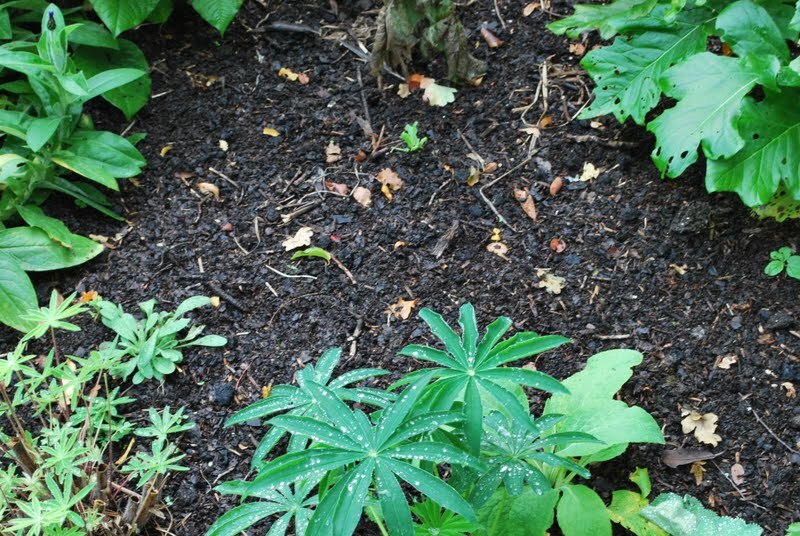 I planted three in my last garden and really miss them after five years of training! I'm afraid I'm terribly behind with reading other people's blogs – days are just being gobbled up. I thought maybe the mink had got you, or the rougher element among the cows. That might have been preferable to laptop problems, actually. Hope you get them solved without violence on either side. Helenium are among the flowers I most miss being able to grow here–I loved them in Vermont for those wonderful colors that carried so beautifully from mid-summer through (sorry to say it) frost. Also, I'm surprised everyone doesn't have a fern and turk's cap lily boat. They will, now that you've started the trend. Have your mandarin ducks moved back in again? Go live real life some more if you must. I guess you did not treat yourself to a Mac…! Hope you have sorted your wireless problem, super infuriating. I had the same problem with a work laptop (not Mac) that just would not connect wirelessly. I had to use a mile long cable… Very annoying. I too have not written a blog in sometime, will write one today. Have been so busy renovating our aged old espalier apple trees, which are (wrongly) huge, and needed mega work. That will be the content for the next post. 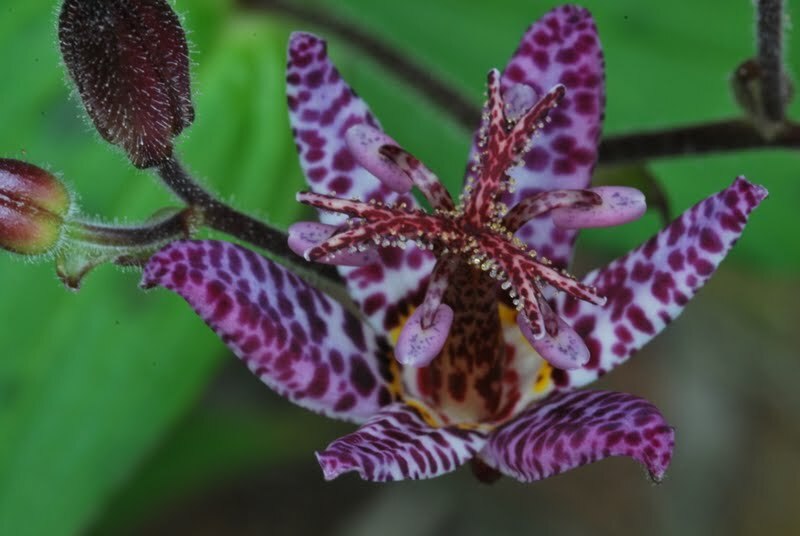 Love your toad lily. I have them too and adore them. They come out now and are just so special. I take cuttings in spring, very easily. Lovely post! Enjoy the painting!